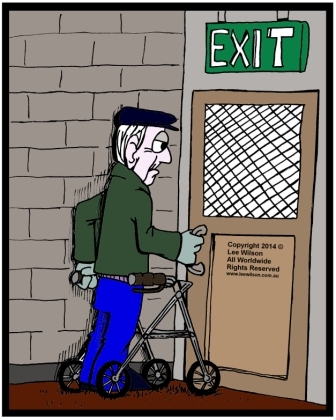 A gap exists in most countries legislative framework relating to the evacuation of people with disability under current disability discrimination, building and workplace safety laws. The gap exposes those members of the community with disability, particularly those with sensory or mobility disabilities to the risk of being delayed in their ability to evacuate a building or being entrapped within a building that has been evacuated. The situation exists where buildings are increasing being built or upgraded to be more accessible – without considering how to get all occupants out in an emergency.  In 2009 the Australian Bureau of Statistics reported that there were four million Australians or 18.5% of the population with a disability. The figures are comparative to other westernized countries. In comparison and to consider the issue from a global viewpoint, there are 36 million people with a disability in the United States alone, of which 19.4 million have difficulties walking or climbing stairs, which is equivalent to the entire Australian population in 2001. The UN has also released data that states that 15% of the world’s population has a disability and this equates to over 1 billion people. 1 in 3 people have a disability or are likely to be close to someone with a disability. 1 million Australians of working age (15 to 64 years) have a disability. 4 million Australians (or 15% of the population) have a physical disability. There are approximately 30,000 Deaf Auslan (Australian Sign Language) users with total hearing loss. Vision Australia estimates there are currently 357,000 people in Australia who are blind or have low vision. Over 700,000 Australians have an intellectual impairment. 10% of the population has dyslexia. More than 90,000 people have a mental health disorder. Almost 90 per cent of disabilities are not visible. Another important consideration will be the age demographics of society in future years. It has been forecast that the proportion of the Australian population over 65 will increase from 14% in 2011 to 25% in 2100 which potentially will see an increase in the number of persons with a disability. This is comparative to international population projections prepared by the United Nations which predict the number of people over 65 is set to double within just 25 years. The number of people aged 85 years and over in Australia is projected to increase rapidly, going from 344,000 in 2007 to 1.7 million in 2056. Given these recent trends, it is also fair to assume that in the future people will be working longer. A recent analysis of 43 countries by researchers from Harvard University found that between 1965 and 2005 the average legal retirement age increased by less than six months, but in contrast life expectancy increased by nine years, with many European countries now linking the legal retirement age to life expectancy data. Similarly, the Australian Government as recently as May 2014 announced that people will have to remain working until they are 70 years old before they are eligible for the age pension. This equates to a significant percentage of people who may have little consideration for their safe evacuation from a commercial building. Consideration of the needs of all occupants is especially important for those facing a vertical egress path (i.e. via a stairway). People with disability have increasingly moved into the mainstream of society and deserve to be afforded the same level of safety as they go about their day to day activities as other occupants of buildings. After all, there are statutory obligations within many countries, including Australia that require employers, building or facility management, building contractors and building designers to contribute to a workplace that is “without risks to the health and safety of any person”. The practical and equitable provision of safe egress for all building occupants has been a complex issue to resolve, with a general lack of awareness, understanding and a failure to provide a holistic approach from all parties. 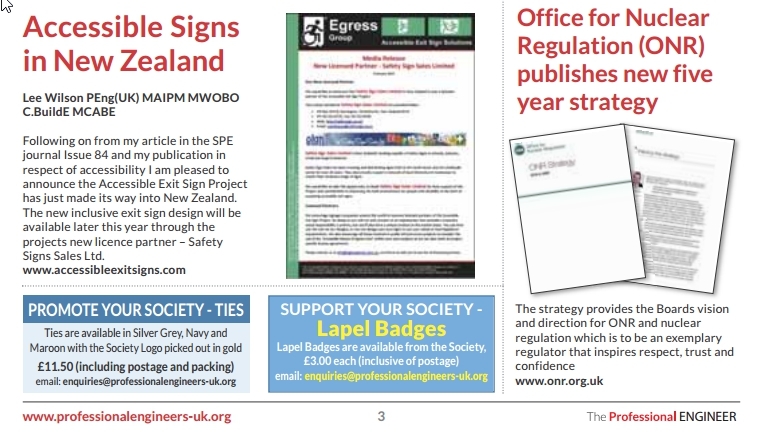 The issue of discussing emergency egress within workplaces has previously been described by U.K. based Northern Officer Group in 1993 as “opening the proverbial can of worms”, where employees with disabilities would rather keep quiet than cause any trouble or risk their own employment opportunities. This is not an acceptable situation and needs more consideration. 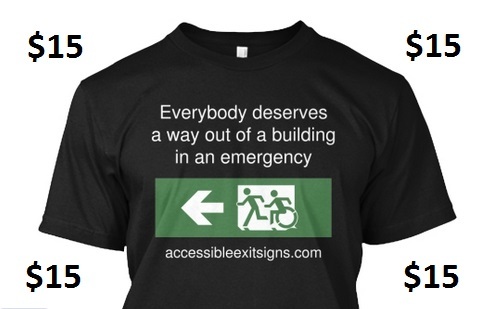 More consideration needs to be made to the provision of equitable egress provisions in buildings with an accessible means of egress and appropriate exit signage. 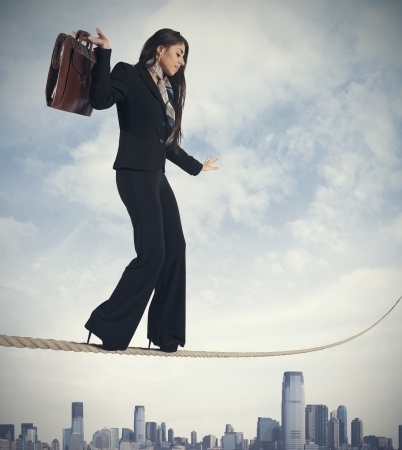 Workplaces need to promote an environment where discussions on an individuals needs for evacuation can be raised without fear of recourse and confidentiality. I’d encourage every one to read the guidebook below from which this article has been adapted. The guidebook will help all readers understand the issues, the risks, and identify strategies to provide a safe building for ALL occupants. Though the book discusses the Australian legislation, the concepts are applicable where ever you call home. 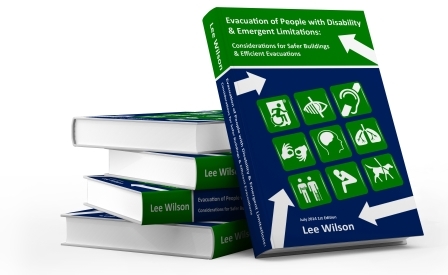 By Lee Wilson, author of the evacuation guidebook titled “Evacuation of People with Disability & Emergent Limitations: Considerations for Safer Buildings & Efficient Evacuations”.